Send a hungry college student a care package! Our Casa de Fruta wooden gift crate is packed with lots of goodies for late-night studying. Chocolate Espresso Tuxedo Beans 8 oz. 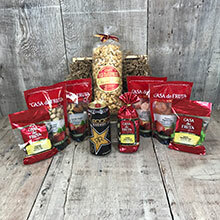 Trail Mix Delight 7 oz. Roasted & Salted Pistachios 6 oz. Chocolate Bridge Mix 3 oz. Gummi Rainforest Frogs 3 oz. Freeze-Dried Fruit Salad 1.25 oz. Net Wt. 61.25 oz. Ship Wt. 8 lb.